Please enter your username and password to access your information. Find out which General Contractors run a good project; and which Contractors to avoid! Every meeting includes a Business Practices Information session for members to exchange information on General Contractors in this market. In today’s aggressive market, you need to differentiate between the "good guys" and the rest of the pack..
Sign in to fill out a BPI Request. Our monthly dinner meeting provides networking for our members along with programs on topics geared to our members. Our Seminars are designed to keep Subcontractors up to date on the changes in the industry. 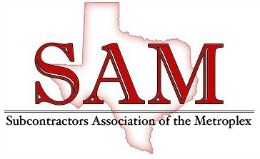 With your SAM membership you are also joining the National Subcontractors Alliance (NSA) and the Texas Construction Association (TCA). You now have powerful voices in Washington and Austin protecting and fighting for your rights as a Subcontractor.